There are mixed opinions on whether or not a play kitchen belongs in a Montessori environment, though most lean towards no. In most traditional Montessori classrooms, play kitchens are replaced with purposeful work, e.g. preparing and cooking real food, and cleaning up real dishes. Children not only get more out of this experience, but they typically prefer it. I know that Dakota, at 18 months, prefers practical life work more than anything else. 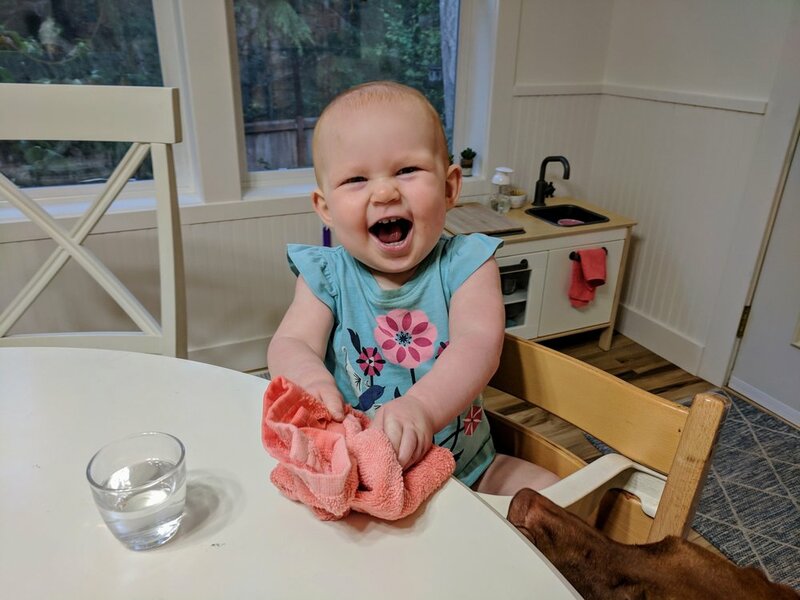 Her favorite activities are the ones she sees us doing every day: putting dishes away, washing hands (D could do this all day), pouring water, helping prepare food, and cleaning up (sometimes making a mess just to do so). I can clearly see D’s focus, satisfaction, and pride as she does these tasks. To best serve D’s toddler needs, I been making the IKEA play kitchen more and more functional for her. I started by removing the parts that weren’t serving any purpose: the microwave, the faucet that didn’t produce water, and the light-up stovetop. This past weekend, I replaced the faucet with this glass water dispenser that is easy to turn on and off, and can produce a very slow flow of water. She can fill the sink with water, pump a little soap from this soap dispenser, and wash her hands or dishes. It took a few tries to find a water dispenser that fit this kitchen and didn’t arrive broken(! ), but we are so happy with the final result. Though she still needs some assistance turning the water on and pumping out soap, she’s not far from doing all this on her own. I also replaced the stovetop with a cutting board where she can practice chopping real fruit or vegetables. After snacks or meals, I lay out a towel over it for her to place her dishes. For now, this cutting board is most often used to set out snack for her to serve herself. I place a pre-portioned amount for her to scoop or transfer to her plate. Though she likes to fill her water glass from the water dispenser now, she also still pours water and milk from a small pitcher into her glass. She can then carry her plate and glass to her small table to eat. Dakota loves this simple act of independence! On the right she has larger utensils for helping to bake or prepare snack, towels for wiping up spills, and a small dustpan for cleaning up crumbs and small pieces of food. Each one of these items doesn’t get used every day, but they all serve a function and have been used with purpose. 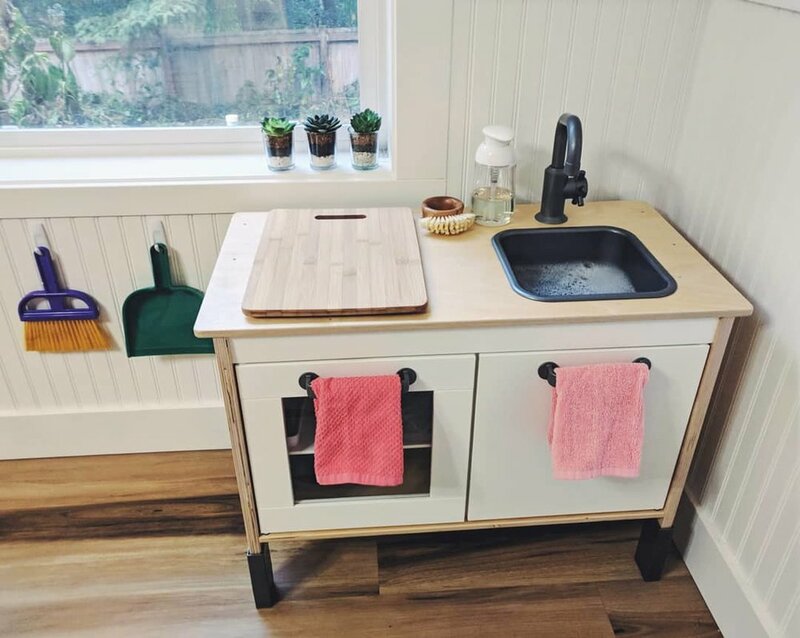 To the left of the kitchen she has a dustpan and brush, a laundry bin for dirty/wet towels, and a compost bin to put her scraps after eating. (The compost we only put out at mealtimes thanks to our always-hungry vizsla!) Lastly, above the kitchen I keep a little wall art for her to look at, and now practice labeling. Dakota has always been a big fan of food and all things related. Now that she is 14 months, we’ve expanded on this “passion” by finding ways for her to be involved in the food making and clean-up process. She LOVES it. Dakota isn’t alone in this. A core element and toddler favorite in a Montessori toddler classroom is practical life, which are the activities of everyday life. This includes tasks such as setting the table, preparing meals, wiping the table, washing hands, dusting, watering plants, etc. Often the things we find monotonous toddlers find energizing. ;) Toddlers are natural imitators, and these types of activities give them the satisfaction of repetition, purpose, sensory experiences, concentration, and belonging in their family or community. Since Dakota is still a young toddler and not yet walking, I found it challenging at first to come up with appropriate activities for her. But when I introduced activities such as banana peeling and water pouring and watched her handle these tasks with such precision and care, I was reminded of just how capable toddlers can be. Not every activity has been so successful, and it’s important to remind myself that the important part for toddlers is the process rather than the product. Even if she isn’t successfully scrubbing dirt off of a carrot, she is concentrating and figuring out how things work together each time she practices or explores with her hands. And she is more interested in trying new foods. With practice comes precision! We have a few areas of the kitchen/dining area for her to work. One is the kitchen helper my husband made. He made a simplified version of this one I saw on Etsy. Dakota loves to stand up at the counter with me and both watch and participate in her food preparation. She also sits at her small weaning table to do precise work such as water pouring and peeling at meals. Lastly, she can work at her modified IKEA kitchen, where I fill a sink with soapy water for her to practice doing the dishes, and have a cutting board for her to practice chopping. Variety keeps it interesting! Spreading - I found this pack of 3 tiny spreaders that are perfect for little toddler hands. 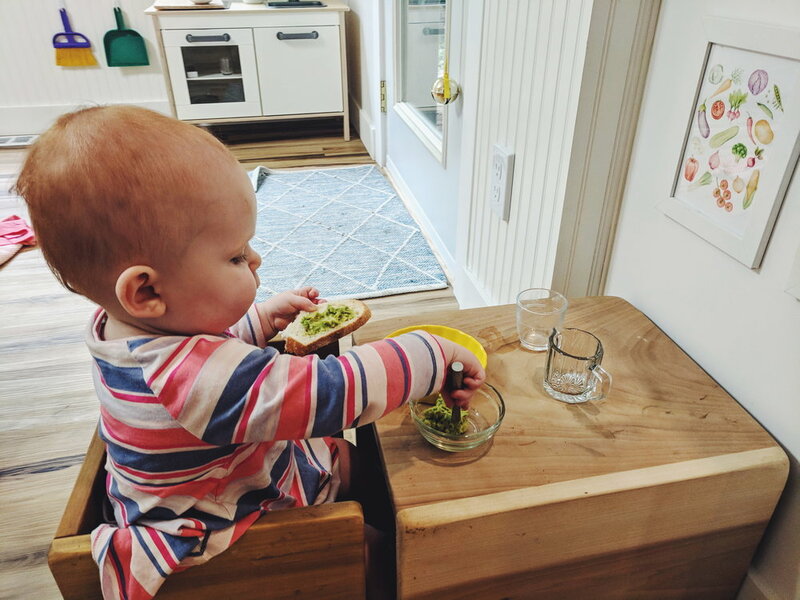 She practices spreading mashed avocado, hummus, or nut butter on toast. Often the spreader ends up in her mouth! ;) You can also purchase spreaders from Amazon here. Water pouring - These small creamer pitchers are perfect for the tiniest of hands! She loves to pour water into her glass or just pour rice or liquid between two pitchers. Transferring - Sometimes the simplest tasks have a purpose for toddlers. She always enjoys having two little plates on the table, and we practice moving the food from the “serving” plate to her plate before eating. Mashing - This little masher is perfect for mashing avocado, banana, or even mashed potatoes! Scrubbing - Dakota uses this scrubber to scrub vegetables such as carrots in her Ikea kitchen sink. She loves the feel of the bristles. Chopping - This wavy chopper is the easiest way to start. Dakota has had some success with the banana, and next we’ll try cucumber. Washing - We have a set of these swedish dishcloths for Dakota to wash her dishes with. She especially likes to wring it out in the sink! Sweeping - Dakota loves to sweep the floor with this little broom and dust pan! Washing hands - This soap dispenser is simple and easy for little hands to push to get soap out. She still needs our help with this, but we keep it accessible at the Ikea kitchen sink. Peeling - We started with banana slices with the skin on for her to peel off, and are now trying satsumas. It helps to cut slits in the peel to help them get started. And there are endless more to come! What are your toddler's favorite practical life activities? Cups, Straws, and Spoons, Oh My! This past month has been a huge leap in independence for 11-mo-old Dakota. Now that she can navigate our house quickly and efficiently, she wants to do everything on her own! Namely, eating and drinking. Whether it's the bottle or the spoon, she wants control. And while messes are made and patience (mine) is tested, I'm all for giving her this independence. By giving Dakota her own table, or a place at our table, and the same tools we use to eat and drink, she feels respected, trusted, and like an equal member of our family! When we introduced the weaning cup around 8 months, Dakota enjoyed drinking from it but not holding it. Around 10 months, she began to show interest in using it independently - reaching for it on the table or whining when I tried to do it for her. I modeled how we use two hands to bring it to our mouth and set it back down. Gradually, she figured it out herself. While she still struggles with setting it back down upright, she has really gotten the hang of bringing it to her mouth and drinking from it. We just put water in the cup for now, but eventually she'll drink milk from it too. When she starts dipping her fingers or food in the cup, or tosses it, we just take a break from the cup and try again later. While she can play with her food on her plate, the cup is for drinking. Around the same time Dakota showed interest in drinking from the cup herself (10 months), she began to figure out how to use the spoon. Puree or not, she likes to hold the spoon and "dip" it in her food. When she does have a puree, yogurt, or chia pudding, she has actually figured out the sequence of dipping the spoon, bringing it to her mouth, and slurping - repeat. Video below. As you can see, it's not always a smooth sequence, or super effective. ;) The important thing is to let her practice, because she gets better every time. And it is obvious how much she enjoys feeding herself! There is nothing that makes me happier than her feeling proud of herself for something she has really worked hard on. Side note: Though Dakota consumes most of her liquids via breastfeeding or bottles, I also give her a water cup with a straw when we are on the go. We have avoided sippy cups based on recommendations from feeding and speech therapists. (For a good article about straw cups vs. sippy cups, check this out: http://noahsdad.com/cup/.) I was also surprised how easy it was for Dakota to learn how to drink from a straw. I introduced the straw at 9 months with these take and toss cups. These simple, inexpensive cups were great because they allowed me to squeeze the cup, causing water to come out, showing her how the straw works. We recently graduated to this water bottle that we can take on the go. That being said, we mostly focus on the weaning cup for water at home, because it gives her a chance to learn how to drink with care, like we do! The focus of feeding babies should be on satiation and taste, rather than calories or fullness. I do think the author makes a good point that in America, we are so worried when we start introducing solids, that it takes away the pleasure of eating. Before the age of 1, babies are still getting most of their nutrients from milk, so eating can simply be a chance for babies to get used to lots of different tastes and textures. Your child doesn't have to like the food, or even eat it, but they do have to taste it. This is an easy rule to start with babies. I've heard it a thousand times but I still need the reminder that it can take a dozen introductions for a baby to like a new food. Variety and "eating the rainbow" is so important, and if we stick with only the food they immediately like, it'll be that much harder to deal with the picky toddler years! Now that the local farmers market is open, I'm using that as an opportunity to introduce new fruits and veggies, for both of us! Make mealtime a pleasant and relaxed place to eat. This is definitely one of those "easier said than done" rules for most families. 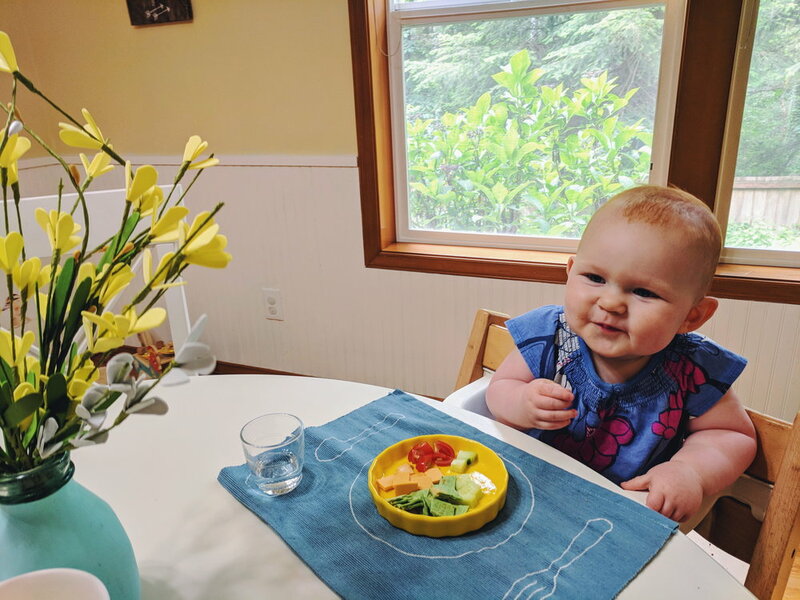 I do find that when I sit and eat with Dakota at the table, she is generally happier during the process (though she does also love her weaning table, so we do both). This "rule" also incorporates the idea of setting the table before eating. We don't make it fancy, but giving Dakota real dishes gives her a sense of autonomy and a chance to learn consequences of throwing ("all done!"). A little (healthy) fat is good for babies. The French are pros at making vegetables taste delicious, and I'm pretty sure their secret is butter. The key is that they are cooking with high quality ingredients, including the fats they use. From what I've read, there is nothing wrong with adding a tiny dab of butter or olive oil to your baby's steamed veggies, and in fact, babies need healthy fats more than anything at this stage. Other good sources of fat that we've introduced are avocado, chia (sprinkled on fruit), nut butter (mixed into oats), eggs, and yogurt. As a foodie myself, I was eagerly anticipating Dakota's introduction to solid foods. Avocados, delicata, plums, oh my! As most things in child rearing, there are numerous methods for when and how to start solids, so you have to just pick your path and go with it. I leaned on my mama intuition, my fellow Montessori bloggers, and Dakota's readiness to figure out how to start this exciting food journey. Dakota started showing signs of readiness for solids a little after 4 months, so we started at 4 and a half months. Specifically: good head control, super interested in our food (and licking her lips accordingly), doubled her birth weight, and 2 early bottom teeth. Most importantly, when I tested out giving her a little spoonful of food, she closed her mouth around the spoon, swallowed, and smiled wide! 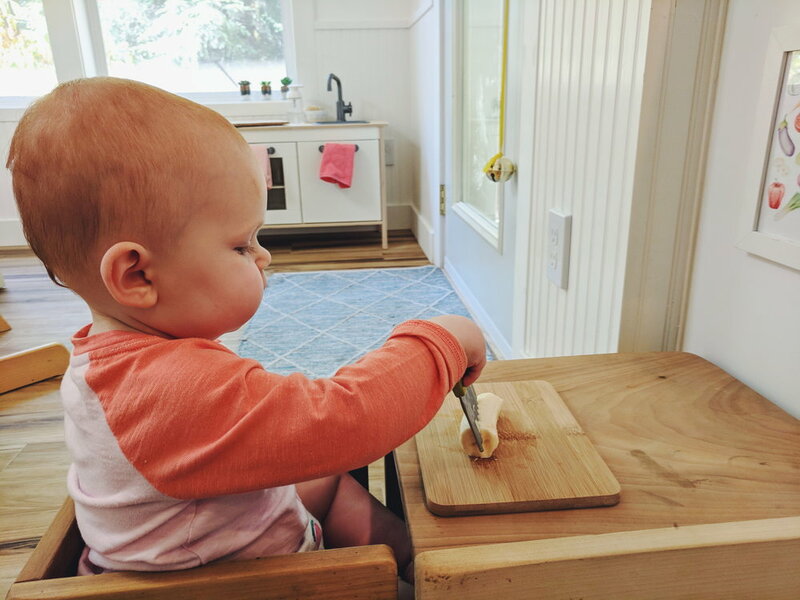 Though I was tempted to start with baby-led weaning (no purees - just small bits of whole food), I felt more comfortable starting with homemade single-food purees, to help her ease into solid foods and digestion. I purchased this all-in-one baby food maker to easily steam and puree my own veggies and fruits. I started with whole-grain cereal, followed by avocado, butternut squash, sweet potato, and then apple. I wanted to start with vegetables rather than fruits so that she didn't only want the sweet stuff! To make the purees extra creamy and digestible, I mixed in a little breastmilk too. Because Dakota's body still only needs the nutritions that come from milk at this point, she's really just tasting each of these foods rather than filling up on them. 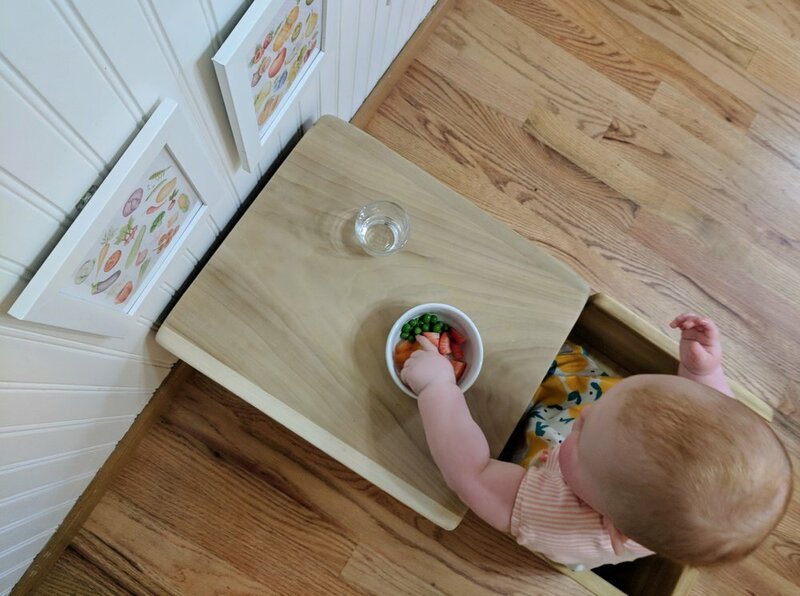 Although we have this awesome high chair that will grow with Dakota through the years and be perfect for family meals, we are starting Dakota off at this weaning table. This is a baby-appropriate table and chair that she can sit up in by herself and eventually get in and out of without adult assistance. The weaning table promotes independence, child participation, and a focus on treating infants as "real" people. Very Montessori. :) Already I can see that Dakota wants to do as I do, particularly when it comes to eating, and this is one step in that direction. My favorite elements of the Montessori "weaning" set-up is that Dakota gets her own spoon to self-feed. While I started out feeding her myself, she right away wanted to take hold of the spoon, so I began to let her. I was surprised at how good she was at getting the puree right into her mouth (or at least close)! We have some lovely bamboo & rubber spoons but they are still too big for her, so this week I purchased these sweet little espresso spoons for her to feed herself. You can see photos of her first experience with this spoon - not bad! For now, I'm scooping the puree with the spoon and then handing it to her. I still feed her too, so we each have a spoon and take turns. Obviously we are just embracing the mess. But with a bit (a lot) more practice, she'll be feeding herself like a pro. Why the silver spoons, pictures above the table, and glass bowls? They all promote the feeling that our home is just as much Dakota's as it is ours. She is just as deserving of the kind of dishes and set-up we have ourselves, and she learns to care for them as we do. It's a way to show Dakota respect while also teaching her how to respect her environment. Obviously there are many ways to do this, and using plastic is totally fine, but this is one way to go about introducing food, Montessori style. I imagine we'll do some breakable and some non-breakable dishes depending on time and place! In the next month or two we'll introduce a small glass for her to learn to drink water from and more whole food to explore and taste. There'll be breaks and messes, but also lots of opportunities for learning and enjoying glorious food! The beauty of an independent weaning table. But one baby step at a time. :) The food journey is only just beginning!